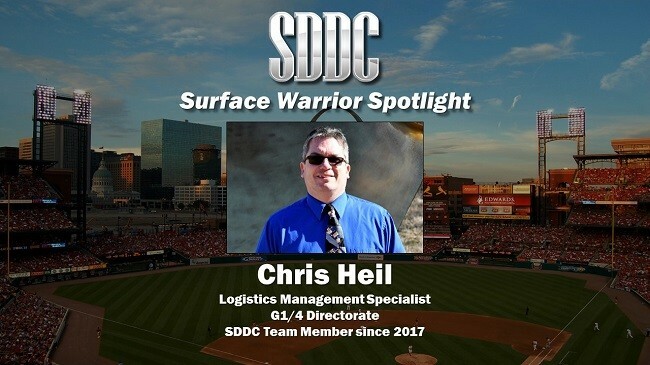 Chris Heil, from the Military Surface Deployment and Distribution Command (SDDC)'s Personnel and Logistics Directorate (G1/4), is the tenth Surface Warrior to shine in SDDC's spotlight. 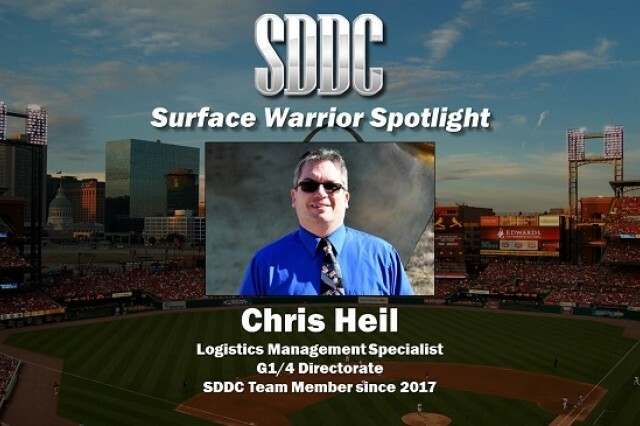 Having joined SDDC in 2017 as a logistics management specialist, Heil assists units around the globe with maintenance and equipment readiness. "The goal is to ensure the supported units can successfully complete their mission with their assigned equipment," Heil said. To be recognized in the Surface Warrior Spotlight, SDDC civilian employees must be nominated by their chain of command. Heil was nominated by Charlie Westgate, the G1/4 deputy director. Now it's time to bring Chris into the Spotlight. A: I worked for the Aviation/Missile Command, which is a Life Cycle Management Command under Army Materiel Command (AMC). I supported the warfighter directly by providing logistics support to the Army's land combat missile systems while stationed at Fort Knox, Fort Irwin National Training Center and deployments to Iraq and Afghanistan. This position allowed me to work with and learn from some great people from both the military and civilian sectors. Q: How did you first learn about SDDC? A: I was vaguely familiar with SDDC since SDDC is under the AMC umbrella, but did not know much about the SDDC mission until I began working here. Q: How do you balance your career at SDDC and family? A: I make sure not to take work home with me. When I'm with my family, they are my focus. A: I enjoy where I am at right now -- maybe ask me again in a few years down the road. A: The team that I work with. The G 1/4 Logistics Division Team has been one of the best teams I've ever worked with. A: "Snakes, why did it have to be snakes?!?" - Indiana Jones. A: We went to Disneyland in the spring of 2016. It was my son's graduation gift from high school and this was the last vacation we would have together as a family before he left for the Air Force. We created many great memories as a family. A: I am more of an introvert. However, I can break out of that shell when the mission dictates. A: I had dreams of being a professional baseball player. A: "I know the plans I have for you, declares the LORD. Plans to prosper you and not to harm you, plans to give you hope and a future." No matter what we go through in this life, good or bad, we can trust that God has our best interests at heart. A: Success can be defined by God's greatest commandment for us: "To love God with all of our heart, soul, and mind and to love other people that we meet along this journey of life." If we can do this we can be sure we have led a full life. A: Kevin James, he's a comedian. We share something in common -- we are both overweight! A: This goes back to what I wanted to be as a 10-year-old. I would love to be a Major League Baseball player -- especially as a pitcher for the St. Louis Cardinals. Q: If you could interview one person (dead or alive), who would it be? A: I would choose Mozart. I love music and would enjoy talking music with him. A: When Martin Luther published his 95 Theses in 1517 marking the beginning of the Reformation. A: It would have to be BBQ -- any and all, I love a good BBQ. A: I would be an eagle, so that I could have the freedom to soar high among the mountaintops. Q: Can you tell us a little bit about your family. A: I married my high school sweetheart and will be married for 25 years this July. I have three children. My son is the oldest and he is currently enlisted in the Air Force. I have two daughters; one is a freshman in high school and the other is an eighth grader. We also have three dogs, an Australian Shepherd and two Chihuahuas. Oh, and a cat that is the spawn of the devil. Q: What are three things most people don't know about you? A: I have a Master's Degree in Divinity. I play the bass (guitar, not the fish). And as I mentioned earlier, I am married to my high school sweetheart. A: Be honest. Have integrity. Be trustworthy. A: The Screwtape Letters by C.S. Lewis. Q: What have you always wanted to try but never did? A: It would have to be skydiving, but common sense prevents me. Q: What has been the most important innovation you have witnessed in your lifetime? A: The Internet/e-mail. It has made communication so much easier. A: My family. They are the reason I keep going. A: Drivers on their cell phones -- pay attention to the road already! A: Snakes. Hence the favorite movie quote. A: I am able to get on my wife's nerves at any given moment. A: Live life in the moment to its fullest, tomorrow isn't guaranteed. A: I enjoy playing racquet ball and spending time with my family. Q: What music is on your cell phone? A: Metallica, Metallica, and more Metallica! A: I would be in the medical field, so that I can help others. SDDC's "Surface Warrior Spotlight" program highlights different members of the SDDC workforce every few weeks through a series of interview-style questions that focus on his or her unique background, personal stories and experiences.